Legendary All-Star Tracer and Genji skins reduced to 200 Overwatch League Tokens each. – AiPT! Legendary All-Star Tracer and Genji skins reduced to 200 Overwatch League Tokens each. The price is falling fast. Almost as fast as these flankers move. Overwatch All-Star weekend is approaching fast and with it the two newly announced legendary Tracer and Genji skins. Blizzard had previously announced that the skins would be available for 200 Overwatch League Tokens a piece, but that’s no longer the case. The Overwatch League Twitter account just made an official announcement that the skins will now be available for 200 Overwatch League tokens, a reduction of a whopping 100 tokens. You really don’t have an excuse not to pick them up now. See the announcement below. 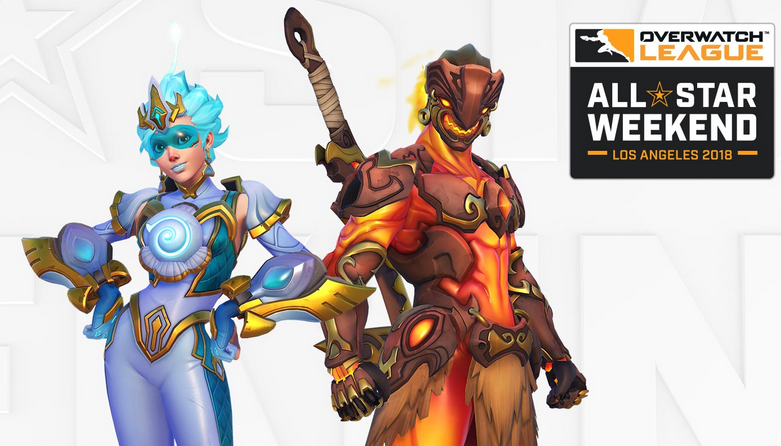 The legendary All-Star Tracer and Genji skins have been reduced to 200 Overwatch League Tokens each! Get yours from Aug. 17-27. The All-Star Weekend brings a number of events for fans to enjoy: Lucioball showdown, Mystery Heroes, Widowmaker 1v1, Talent Takedown, Lockout Elimination, and of course, the All-Star game itself. For more information on these events, check out the official Overwatch All-Star Weekend page here. The Overwatch All-Star Weekend events will be available to watch live through streaming services on Twitch, OverwatchLeague.com, the Overwatch League app, MLG.com, and the MLG app. ESPN3 and Disney XD will also broadcast the events live on Saturday from 4-10 p.m. PDT, and on Sunday from 11 a.m.-2 p.m. PDT.